Weduary is an innovative online service social wedding website that can greatly help brides and grooms to organize biggest day of their lives, enhance their wedding by having centralized website filled with all necessary information and gather their guests in a social network that will have them buzzing for weeks before the wedding day. Amazing Social wedding website! 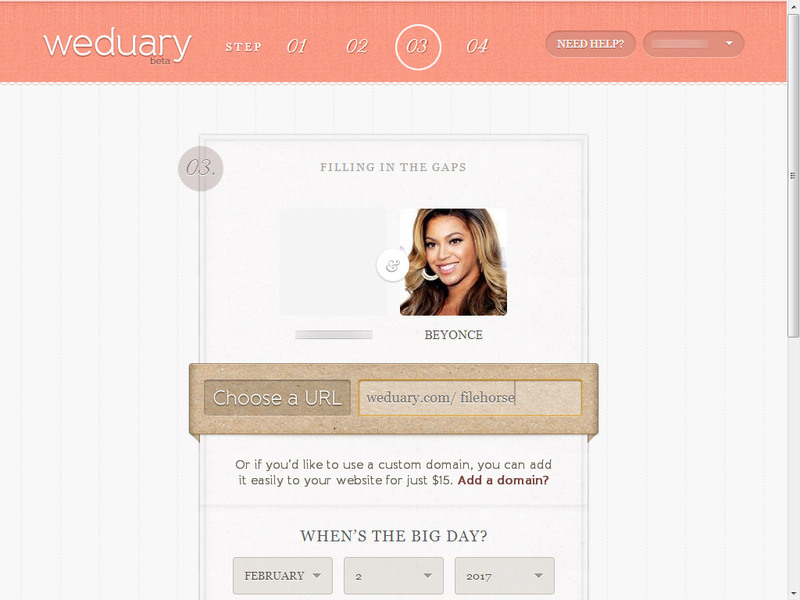 Using Weduary is extremely easy. Bride and groom can with few click create their own website with custom color schemes, variety of appealing visual themes, and fill it with their wedding date, restaurants information, Google maps data, descriptions of the events and multimedia. After that they can establish RSVP lists for guests and send invitations via social networks or email. By bringing your guest to this innovative service, everyone can start sharing stories about the happy couple, match guest by common interests, and socialize with friends and family for weeks and months before wedding day arrives. 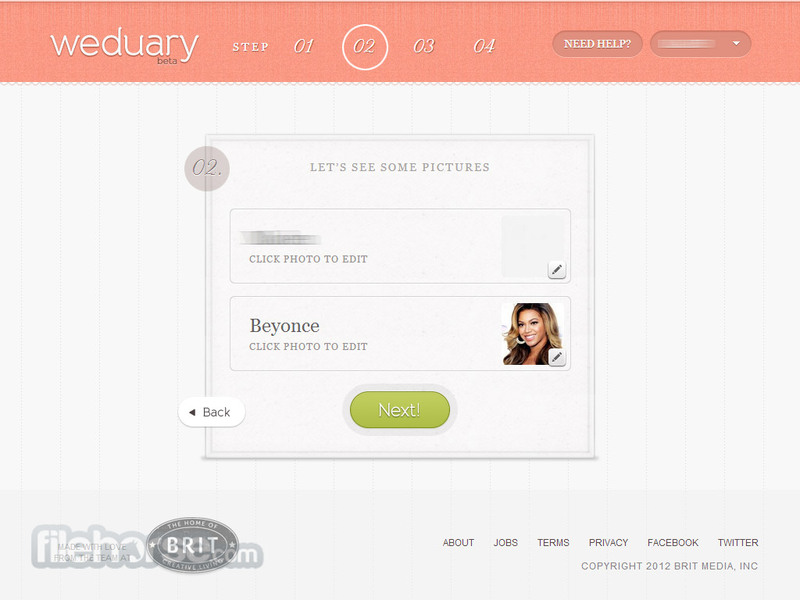 Great social wedding online software, Weduary! 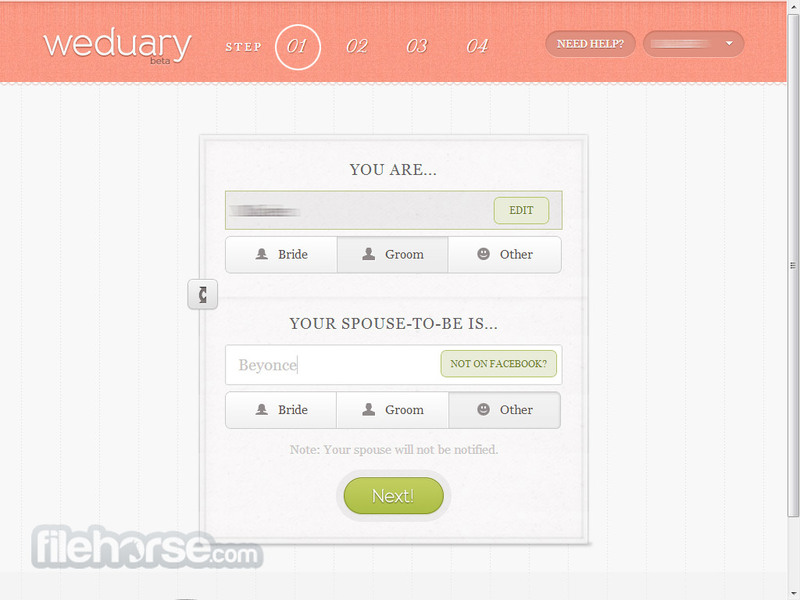 Plan your wedding and manage your guests with Weduary! Planning your perfect wedding day is not an easy task, and managing to avoid causing bride to scream and guests to be unhappy is a challenging process that each bride and groom need to take seriously. To make the organization of the wedding day a much easier experience, developers of Weduary have created nicely packaged online solution for every bride and groom. Gone are the days of manually creating invite lists, checking the availability of guests and informing them of the schedule for a wedding day by phone. Using Weduary you can create centralized page for your wedding day that has all the information about schedule, photos of where event will take place, map data, and more. All that happy couple then needs to do is to invite their guests via Facebook and email, and then they can all start communicating in their little own social network. Weduaryhas received high marks from online community because it has managed to create a unique website that can truly help happy couples. 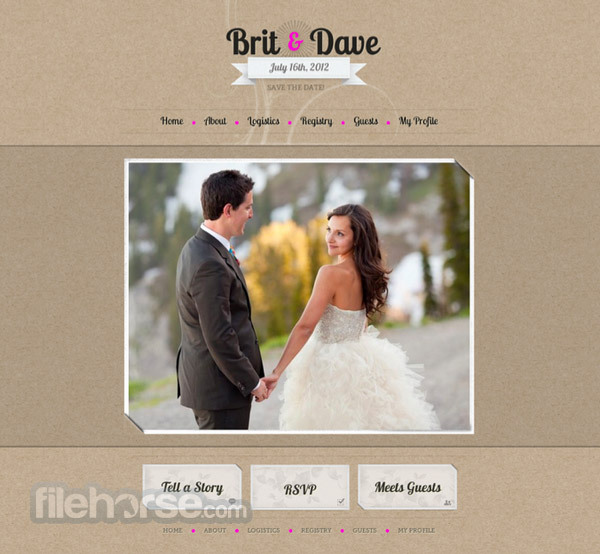 When you arrive on the site you will be instantly offered to create your wedding page for free. The process of building up that page entails entering data about happy couple, adding pictures, information about date of the wedding, and finally creating the invite list. When the invite list is sent, guest can confirm their RSVPs (bride and groom have a total and real-time oversight over RVSP lists), individual pages about the even can be made public or private (if someone wants to prepare special surprise that must remain hidden until the wedding day), and guests can meet each other in this mini-social network, mingle with each other, share stories and match common interests. If one thing needs to be said about Weduary is that it does not only offer its user great service, but that it manages to does so by also looking absolutely great! Modern and sleek design that mixes red and white has perfect mixes of the modern UI designs, enabling everyone from bride and groom to the guests to feel special, welcomed and upbeat. Wedding pages can be customized with themes, custom backgrounds, images, fonts, layouts and textures, so that groom and bride can truly express themselves and welcome guests in an online environment that represents them. Amazing Social wedding website! It is also important to say that editor that makes all this customization possible is easy to use, intuitive, and guides user slowly into customizing every single thing they can think off. Registration options are limited, but the entire process is streamlined to give bride and groom the least possible worries. You can create account by clicking on a bright green button “Try It for Free!” which will prompt user that signup is only possible by associating their Facebook account with Weduary. There are no other ways to create new account. While many other wedding planner sites require their user pay if they want to send a lot of invites, Weduary does not use the same tactics. Everything on Weduary is free, including account creation, sending of invites, managing wedding pages, RSVPs, community and more. However, this may not always remain the same, because Weduary has announced that future subscription plans may be unveiled. 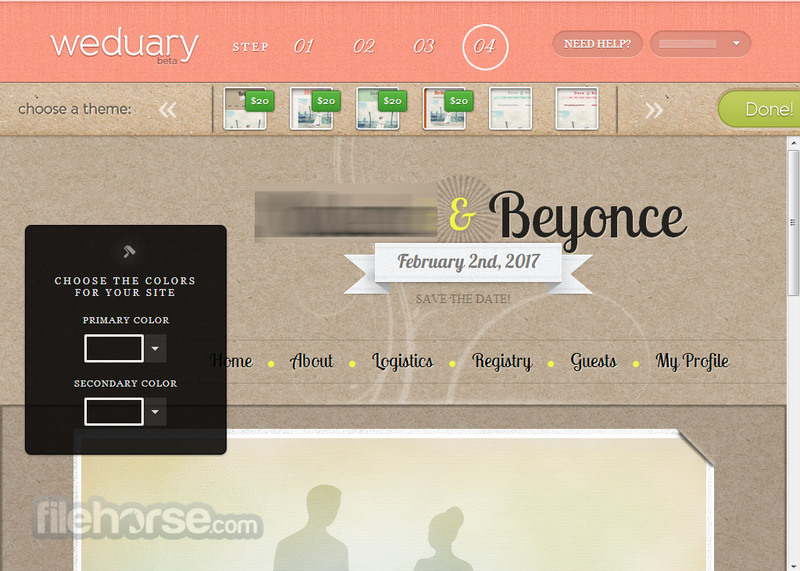 Creating wedding pages with Weduary where you can coordinate plans with guests have never been so easy. Coupled with great design, powerful options, and completely streamlined and free experience, Weduary truly deserves your full attention. Try it out! Amazing Social wedding website! Design a site in minutes using a custom theme, color palette, lots of photos, and more! Invite your guests via Facebook or by email and manage the RSVP list. Guests can meet each other, match common interests, and share stories.